As the year winds down and we start thinking of the next year, it's always fun to see where club members went this year: Larry S. told us about his trip to Iceland and Greenland, Jeff talked about the club trip to Boothbay, Peggy showed a video of beautiful Wales, and Lisa and Linda reminded us that we don't have to go any farther than our own back yard to have wonderful paddling as they shared some of their trips on the St. Croix. 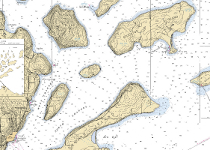 Monthly Program: Ferries, Sailboats, and Jet Skis OH MY! Bernie explained some key parts of the navigational Rules of the Road. Peggy provided some background on how sailboat races work on Lake Calhoun and other locations. 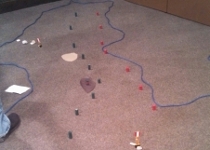 Then we played with toy boats as we explored how to best interact with our fellow vessels on the water. And there was even a riddle. 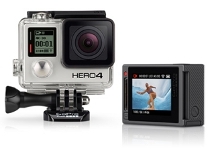 Each new gear guide has more electronic gadgets that promise to make our outdoor experience more rewarding. In this presentation Sam G cut though the marketing claims and discussed the five driving trends in the outdoor industry: portable power, glamping, share your experience, retro, and made in the USA. You may not feel the need to be in contact with people at home while in the wilderness but many people do, and the technology to stay connected is creeping into many outdoor products. It was quite cold for this fall's As If, so the group paddled the planned route but skipped the structured activities, many of which involved getting wet or sitting still. After lunch on Wild Goose Chase Island, part of the group went for an extended paddle and part returned straight back to the launch. It's always a great paddle on our biggest local lake, no matter what we do. Lisa organized a night paddle on Big Marine Lake that began at sunset. 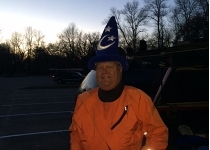 With headlamps at the ready and glow sticks attached to bodies or boats, the group enjoyed an evening that included fog, a paddle through a marina, and a barking dog. Read the full writeup here. Once again club members gathered at the Hok-si-la campground on Lake Pepin for the fall rendezvous. Lake Pepin provided barges and bluffs and big water and fog. Fred described the day perfectly: "spending hours paddling with friends, laughing and enjoying a beautiful day." Photos are here. Jeff and Michelle organized a late fall weekend trip up to the Two Harbors area for a series of day trips. 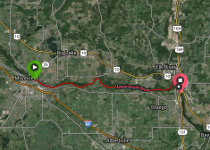 Peggy and Peter L led a trip to paddle the Mississippi from Monticello to Elk River. The trip had been rescheduled from its original date due to bad weather. On this day the weather was fine and the group enjoyed a stretch of river that was new to most. 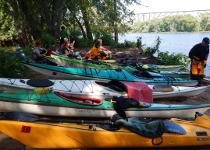 14 ISK members joined trip leader Lisa D to launch from Boom Site in Stillwater and paddle up the St. Croix to the architecturally stunning Arcola Bridge. Along the way they paddled through the heron/egret rookery and enjoyed a beautiful day of fall colors. Trip details are here and photos are here. 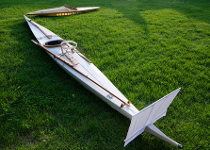 Dave McKinney and Christopher Crowhurst brought boats they have built in to show examples, provide an overview, and answer questions on the basics of two methods for building wooden kayaks: cedar strip and stitch and glue..
Peggy and Bernie led this weekend trip to Bayfield. 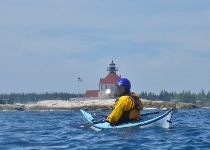 On Saturday the group launched from Meyers Beach, paddled along and into the mainland sea caves, then headed out to Eagle Island, which is restricted for most of the summer. 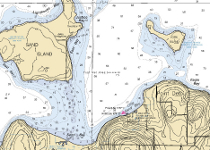 On Sunday the wind was blowing hard from the west, so the group paddled on the sheltered west side of Chequamegon Bay, exploring the Onion River and along rocky cliffs and ledges. Photos are here, here, and here. John Carmody came out from Maine over Labor Day weekend to teach another BCU 3 Star training for club members. Congratulations to our newest BCU 3 Star paddlers: Sharell, Rebecca, Fred, Aaron K , Mike W., and Meredeth. Jeff and Michelle assisted and organized the event. Once again Lynette organized a wonderful picnic and Fred wrangled a terrific rodeo with the assistance of Michelle and Tony S. It's always fun to get together and share food and play on and in the water. On behalf of ISK's Traditional Paddling Committee, Pete, Cindy and Christopher offered a skill building day on Lake Independence. 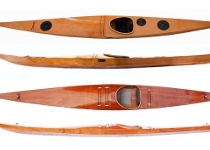 Participants could explore the different ways the Greenland Paddle works, including draw strokes, sculling and how to extend paddles and maximize their effectiveness, enhance turning abilities, and maximize their power and efficiency for strokes, turns and rolls. Ben Lawry returned in July to teach a range of classes to ISK members. Forward Stroke 1 and 2, Core 1, Rescues and Incident Management, and Moving Water were back from last year, with Core 2 being added for the first time this year. 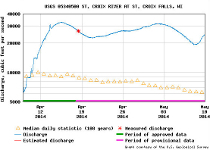 Moving Water 2 was held up at Sauk Rapids in St. Cloud.. There's always plenty new to learn from Ben. Write up is here and photos are here. Jeff F and Michelle offered two WWML 1 classes and one WWML 2 class. WWML 1 was held up in Grand Marais, MN as a three day introductory class to rock gardening. WWML 2 was held in the Bayfield area and gave participants a chance to build on and reinforce their skills. Here are Joyce's review of WWML 1 and Bernie's review of WWML 2. Photos: WWML 1 in June and July, and WWML2 in August. 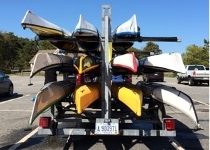 On behalf of ISK's Traditional Paddling Committee, Pete, Cindy and Christopher offered an event at Lake Independence to allow people to use and evaluate more than 20 Greenland paddles from more than 10 paddle makers. 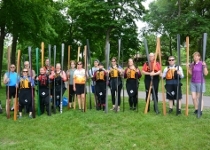 Participants had a chance to try out the variety of shapes, sizes, and styles of paddles, put them through their paces, and discover what they liked. Seven ISK members went out for a paddle on Big Marine Lake on an absolutely gorgeous Friday night. Deb, Dana, Dave, Fran, Virginia, Sharell and Joyce had a great time and were rewarded with a beautiful sunset when they got back to the launch . Peggy and Jeff F taught three Strokes and Maneuvers classes over the summer, giving participants a chance to improve their boat control skills. The "refinement" class gave participants a chance to not only refine but get a video analysis. The "applied" class gave participants a chance to test and improve their strokes' effectiveness in the real world, because that's what it's all about. Tony S and Michelle F offered club members who had previously taken their Intro to Kayaking course the opportunity to try out their skills on Lake Superior. While doing two day trips out of Little Sand Bay in the Apostle Islands, the group worked on basic navigation, essential gear for a day trip and how to pack it, communication, and group leadership and dynamics. Michelle and Tony taught one Intro to Kayaking class in June and Katie, Bernie and Fred taught another one in August, giving newcomers to our sport a chance to get off to a good start. Dan M and Tim M led a trip to Stockton, hoping to get to Michigan. High winds and storms delayed their departure by one day, and caused the trip to stop at Stockton. Planned paddles from Stockton proved not to be viable the next day. The trip home became a challenge due to storm cells. Trip planning and decision making in the face of bad weather became the center point of the trip. Details are here. On behalf of ISK's Traditional Paddling Committee, Christopher and Lynette organized this weekend to work on traditional qajaq skills development. Local mentors introduced and/or tuned up skills ranging from harpoon throwing to forward strokes and turning to rolling. On shore there were evening presentations on the origins of kayak designs, traditional qajaq building skills, knot work and other activities. Event report is here. 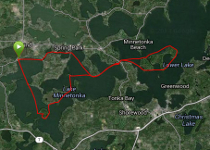 Planned as a follow up to the Open Water Training, only Jeff, Michelle and Sam were able to stay out in the Boothbay area for the week after the open water training. 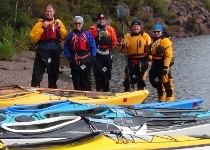 After taking a well earned rest day, the group spent the next 4 days planning and doing day trips in the area, including getting out to Damariscove Island and paddling the Thread of Life. Photos are here. Jeff F organized a trip out to the Boothbay, Maine area to explore and learn in an amazing area. John Carmody was the head coach, with Jeff and Peggy assisting and a total of 9 participants. 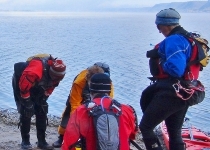 BCU Coastal Navigation and 4 Star Training were included for those interested. 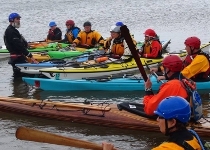 The group paddled in tide races and surf, navigated, played in rocks and at "Lower Hell Gate", paddled out to Seguin Island and lighthouse two miles off shore, and generally had a wonderful time. Photos are here. Lisa and Sue left from Red Cliff on Saturday morning to head to Michigan Island. The pair camped on Michigan for two nights, doing a day trip around Stockton on Sunday before heading back on Monday. 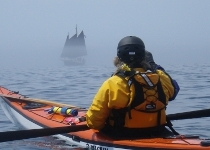 Saturday and Monday provided the opportunity to paddle in fog amid ice bergs. There are a lot of boats out there and it can be a bit confusing if you're trying to find the one that's just right for you. Sam G walked us through the elements of boat design: length, beam, rocker, and hull shape, and talked about how each of these elements affects a boat’s speed, stability, and rough water handling. Spoiler alert: there is no one “perfect boat” that does everything. Linda P scheduled this annual trip with the hope of finding the elusive wildflower window in the Minnesota spring, while avoiding floodwaters. Some years it works, some years it doesn't. "This year the river was raging and extremely high - difficult to find a launch site because once in your boat, the current was going to take you, even if you were launching at a picnic table - it was that high. We shall try again next year!" 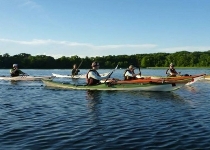 Club members took to the water on Lake Minnetonka to have fun and paddle "as if" they were on an extended day trip on Lake Superior. 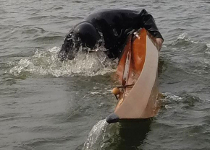 It was a chance to learn, discover, and practice skills they might need to use on more challenging paddles. Jeff F once again organized the day, and he, Michelle, and Peggy were each observers/advisors to a group of participants. Photos are here and here. 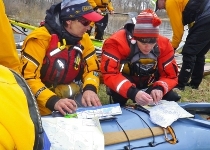 The on-land navigation class participants headed for the water in April to practice their skills on Lake Minnetonka. Whether there would be open water or not was a bit of a nail biter, but the ice cleared out just in time. Participants pre-planned a route on a part of the lake that was less familiar to most, and then paddled their planned route, seeing what worked and what didn't. The group also did on the fly navigation and piloting. Deb S connected us with Judy Julian, a member of the U.S. Coast Guard Auxiliary. Judy is responsible for the Auxiliary’s Search and Rescue training class. 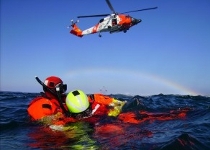 She spoke about the Coast Guard’s maritime search and rescue system, with an emphasis on what we can do to increase the probability of the Coast Guard finding us if we're in trouble. Wilderness First Aid focuses on being prepared for situations and locations when we can't just pick up the phone and call 911. Tom O'Neal again taught this valuable two day class for club members, with a focus on both prevention and treatment. Kenny Blumenfeld gave a presentation on weather and some basic "survival forecasting." 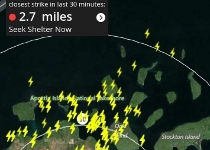 Kenny works with Hennepin County Emergency Management as a hazardous weather research analyst, and shared his wealth of experience of nasty weather. At the annual meeting we elected the new board of directors: Katie Katzner (President), Sharell Benson (Treasurer), Sam Grubisich (On Water Education), Becky Hoye (Secretary), Aaron Katzner (On Land Education), Connie Vandergon (Trips). Many thanks to Christopher Crowhurst, Lynette Woida, and Bernie Graham, who served on the outgoing board. What kayaker on a trip doesn't think about food? 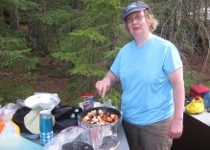 We looked at three different approaches to camp cooking. Fran and Sharell started with elaborate baking and a lot of fresh food. Lynette gave examples using packaged food from the grocery store with some fresh ingredients. Katie showed us some of her favorite home dehydrated meals -- doing most of the prep at home with minimal effort in camp. Jeff, Michelle and Peggy taught two all day navigation classes in February at REI. The classes covered route planning, compass use, fixing position, aids to navigation, tides and currents, and more. This year's Event Planning Party was once again held at the Izaak Walton League Chapter House. We took advantage of having the lovely space all day with an afternoon session led by Dana and Chad called "Does Your Shelter and Fire Making Gear Work or Knot?" Good question! In the evening we gathered to start planning 2014, including handling some club business on our board structure. There was also socializing, some gear was swapped, and food was eaten.